1. While Jews ask God on Rosh Hashanah for a healthy year, non-vegetarian diets have been linked to heart disease, strokes, several forms of cancer, and other illnesses. While we implore “our Father, our King” on Rosh Hashanah to “keep the plague from thy people,” high fat, meat-based diets are causing a plague of degenerative diseases that have led to soaring health care costs. 2. While Jews pray on the Jewish New Year that God “remove pestilence, sword, and famine,” over 70% of the grain grown in the United States is fed to animals destined for slaughter, while ten percent of the world’s people are chronically hungry and an estimated 20 million people die annually because of hunger and its effects. Animal-centered diets, by wasting valuable resources, help to perpetuate the widespread hunger and poverty that often lead to instability and war. 3. While Jews commemorate the creation of the world on Rosh Hashanah, livestock agriculture is a major contributor to many global threats, such as climate change, soil erosion and depletion, air and water pollution related to the production and use of pesticides and chemical fertilizer, and the destruction of tropical rain forests and other habitats. 4. While Jews pray on Rosh Hashanah for God’s compassion during the coming year, many Jews, as well as most other people, partake in a diet that involves animals being raised for food under cruel conditions, in crowded, confined cells, where they are denied fresh air, exercise, and any emotional stimulation. 5. While Judaism teaches that people’s fate for the new year is written on Rosh Hashanah and sealed on Yom Kippur and that repentance, prayer, and charity can cancel a stern decree, the fate of farm animals is determined before they are born and there is no way they can change it. While the Torah and Prophetic readings on Rosh Hashanah describe the great joy of both Sarah and Hannah after they were blessed with sons after it seemed that both were destined to be barren, animal-based diets require the taking of animal babies from their mothers almost immediately after birth. 6. While Rosh Hashanah is a time when we are to “awaken from our slumber” and mend our ways, the consumption of meat and other animal-sourced foods on Rosh Hashanah means that we are continuing the habits that are so detrimental to our health, to animals, to hungry people, and to ecosystems. While we symbolically cast away our sins at tashlich during Rosh Hashanah, the eating of meat means a continuation of the “sins” associated with our diets, with regard to treatment of animals, protecting our health, polluting the environment, and wasting food and other resources. 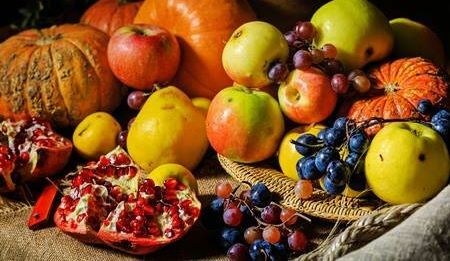 While Rosh Hashanah is meant to be a time of deep contemplation when we carefully examine our deeds, most meat eaters ignore the many moral issues related to their diets. 7. While we speak of God’s “delighting in life” on Rosh Hashanah, the standard American diet annually involves deaths of billions of animals, as well as many human deaths, due to insufficient food in poor countries and too much rich food in the wealthy countries. 8. While Rosh Hashanah has a universal message and involves the prayer that “all the world’s people shall come to serve (God),” many of the world’s people suffer from chronic hunger which denies them the necessary strength and will for devotion, while meat and fish from the choicest land and most bountiful waters of their countries is exported to meet dietary demands in the United States and other developed countries. 9. While Rosh Hashanah is a time of joy (along with sincere meditation), animals on factory farms never have a pleasant day, and millions of people throughout the world are too involved in worrying about their next meal to be able to experience many joyous moments. In view of these and other contradictions, I hope that Jews will enhance their celebrations of the beautiful and spiritually meaningful holiday of Rosh Hashanah by making it a time to begin striving even harder to live up to Judaism’s highest moral values and teachings by moving toward a vegetarian and preferably a vegan diet. *Whenever vegetarianism is mentioned in this article, it means vegetarianism and preferably veganism. Richard H. Schwartz, Ph.D. is a Professor Emeritus of the College of Staten Island. He is the author of several books including Judaism and Vegetarianism; Judaism and Global Survival, Mathematics and Global Survival; and Who Stole My Religion?. He has also written over 250 articles at JewishVeg.org/schwartz. He is the President Emeritus of JewishVeg.org, formerly Jewish Vegetarians of North America (www.JewishVeg.org) and the President of the Society of Ethical and Religious Vegetarians (SERV). He is the associate producer of ‘A Sacred Duty: Applying Jewish Values to Heal the World (www.aSacredDuty.com). Richard currently lives in Israel with his wife and conveniently close to his children and grandchildren.